﻿Schedule your window tint installation ﻿with our NEW online tinting installation scheduler. See when we are here and book accordingly. At most tint shops in Indianapolis, you have to call someone who, may or may not know anything about window tinting. Then, you have to wait while the person on the other end of the phone flips through the calendar to find an open slot to tint your car. If you are fortunate, they will write everything down and will be ready to go when you show up. More often than not that isn't how it goes. Then there is always the possibility that they will over book their appointments and push you to the end of the line if there are a lot of people all in to have window tinting installed at the same time. If all this sounds like a nightmare to you, your right! We knew there had to be a better way. Enter Online Scheduling - the fast, friendly, easy way to schedule your window tint installation. Today people want convenience and speed. Most folks don't want to talk to anyone. They just want to log on, and shop, make an appointment, or post. They don't want to be bothered with calling and talking to someone, unless of course they have a question. Our online booking software puts you in charge all at the touch of your smartphone, or desktop! Now you can book while in your "PJ's", sitting in front of the TV, or late at night after everyone has gone to bed. Then follow these easy steps.. Select the type of window tint you want - Color Stable Dyed, NanoCarbon IR60, NanoCeramic IR80, or our amazing UltraNano Ceramic IR98. There's even a selection for those that are unsure what kind of window tinting they want - it's called "No Film Selected"
Fill in all your information, and tell us what kind of car/truck/SUV/or van you have. Click on the appropriate button when you're done. When the day of your appointment finally comes, you will receive both a text message and an email to remind you of your appointment. You can also change or cancel anytime before the appointment (as long as it is 2 hours before the appointment or longer) by following the link in the confirmation email you'll receive when you first book. All you need do then is show up, pick your film (if you haven't done so already), wait or Uber out while we perform your window tint installation, pay the balance once you are happy with the installation of your window tinting, and drive away! Why do we offer this option for scheduling? As you probably are aware by now, we are NOT like other shops. We are trying to change the perception of the typical window tinting shop and this is just another way we are out to prove to our clients we are a serious business. We are doing everything we can to take the hassle out of getting the windows tinted on your car. With our online window tinting scheduler, the hard part is done for you! We think you will love how effortless this process is and we look forward to hearing from you soon! 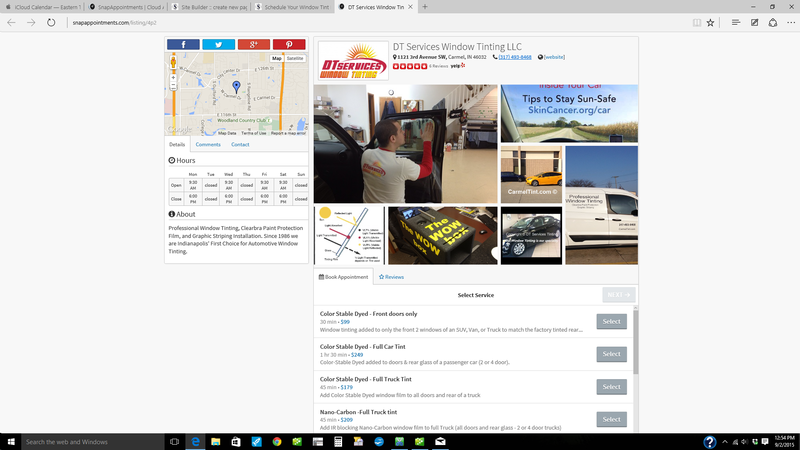 Below is what the page looks like where you can schedule a window tinting installation. Just click on one of the Book Appointment Buttons above.